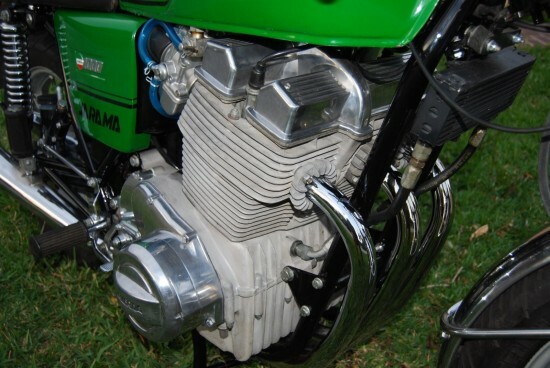 Powered by Laverda’s classic inline triple that displaced 981cc and featured the earlier, burlier 180° crank that had the outside pistons rising and falling together, the three-cylinder Laverdas are pretty imposing beasts. This unusual engine apparently produced more power than a traditional 120° crankshaft configuration, although it also produced far more vibration. 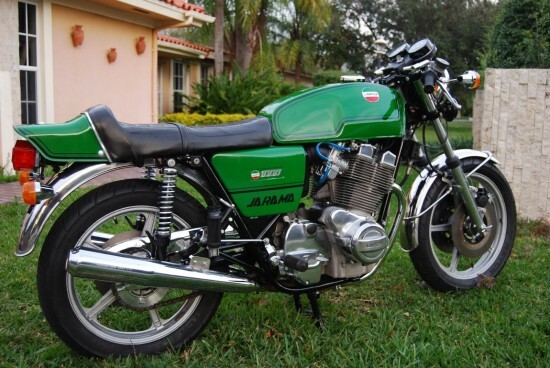 This is an all original 1977 Laverda Jarama 1000 with only 8105 miles in original factory green. The bike recently received a restoration. The frame was sandblasted and painted gloss black. The chainguard was sent to the chromer for replating along with the headlight brackets, exhaust downpipes (headers), Brevetato Jota bars, Ciriani rear shock springs, foot peg brackets and other misc parts, nut and bolts. My plater refused to do the mufflers but they are in great shape anyways. They have some small rust spots here and there but no dents or road rash. 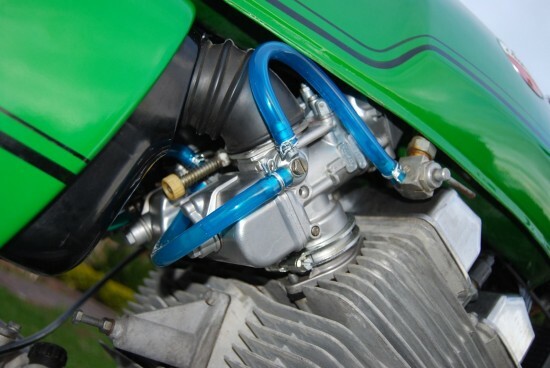 The carbs were completely rebuilt and received vapor blasting and an ultrasonic bath. Carbs also got new seals and misc parts were replaced. As you can see in the pictures all the aluminum covers were polished. Front forks were rebuilt and got new seals. The brake calipers and disc carriers were re-anodized in black. Calipers then received new pistons and seals and so did the front and rear master cylinders. All the nuts, bolts and washers were also cad and zinc plated plated. The bike runs amazingly well and is a blast to ride. and looks beautiful too. Not many Jarama’s in the US. Now the not so bad: I wanted to preserve the original paint so I left it as is. There are two small dents on the tank. One is on the right side and the other is on the left top edge. The left side cover is also cracked and so is the rear tail piece. 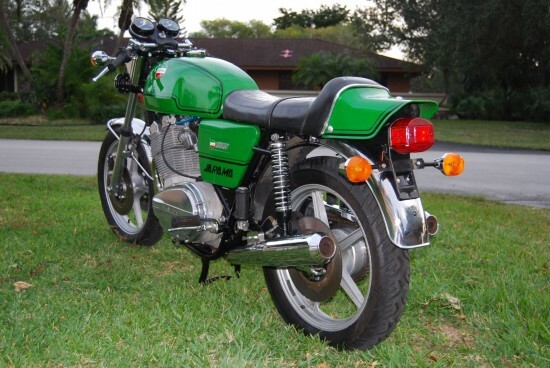 Unlike most Laverdas of the period, the Jarama featured a left side gearshift and other minor changes to appeal to buyers in the American market, although it ultimately didn’t help sales much and the bike is very rare. In many ways, it’s like a Jota “appearance package” except that the base 3CL is still a pretty high-performance motorcycle and probably a better ride for most people than the high-compression, highly-strung Jota. Bidding is active with plenty of time left on the auction. In very sharp condition and with such low miles, this looks like a great opportunity for someone who wants a classic Laverda, but can’t quite stretch to a Jota. 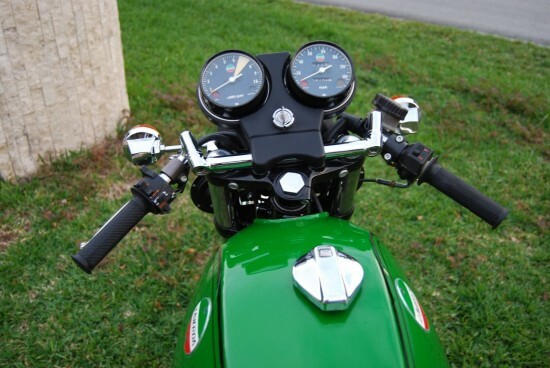 I had a 750SF and my only comment is that the Laverda’s are overly tall (seat height) and wide and a bit awkward to ride. In general they feel pretty top heavy. Compared to the V7 Sport below, which is a beautifully balanced and comfortable bike to ride at speed, I wanted to sell the Laverda after a week of ownership. I’ve heard all that about them but, unfortunately haven’t had personal experience! Luckily I am pretty tall so the height wouldn’t be too much of a problem at least… I ran into a guy on a genuine Jota recently and he was on his tip toes maneuvering it around the parking lot. you’d be on a “Banana Rama Jarama”? These are past the point of actual performance, handling, or usability. Their legend is paramount. Especially now that they are very collectible. Collectors rarely ride their prizes. This is a beast of a bike and they were made for real men. I have ridden several triples in my lifetime and they always bring a big smile to my face (must be the vibration between my legs). Not for the faint of heart. I don’t think I have ever seen a Jarama for sale in the US and if I had the money I would jump on it. Who knows when you will see another like this or in any condition. With the prices of old ducs skyrocketing this would be a great investment. I disagree. Ducati’s are gaining in value at amazing rates is because the brand is strong, vibrant and most importantly, alive. If the Aprilia group ever decides to revive Laverda (they made some prototype bikes I saw at Fiera Milano some years ago) then we might see more collectability. For now it’s just another dead Italian brand, and one without a serious racing pedigree other than some endurance racing. It’s interesting how much in common the ’95 Triumph Speed Triple on RSBFS has in common with these 3CL Laverdas. Both have big cc, overbuilt, torquey 3 cylinder engines, steel frames, relatively physically large and heavy, and both require a lot of rider input. 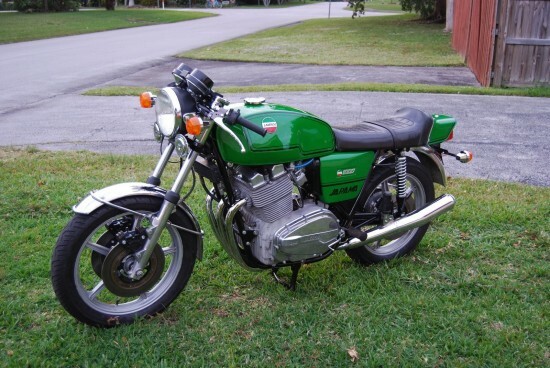 The big difference is, the Laverda bidding is still going North at $12,500 and the Triumph was a no sale at $3,900. I believe these 3CL Laverda’s are steadily increasing in price. I could have bought a good Jota 5 years ago for $8,000 to $10,000 and the Jarama is second tier compared to a Jota. Beats a lot of Wall Street investments. Jordan, It looks like you may have misinterpreted my comment. 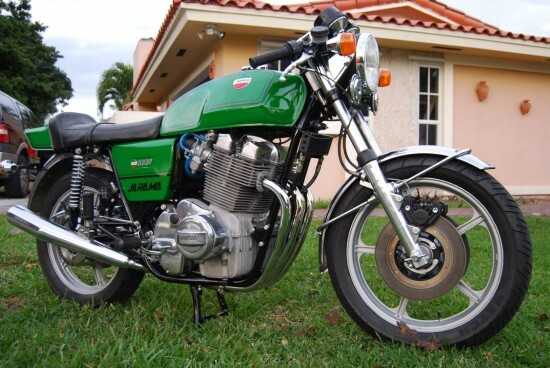 I wasn’t comparing one to the other nor did I say that the value of a Laverda will someday exceed that of a Ducati. There are old bikes out there that are “dead” and most of us can not afford them. Well it went for $15k, not pocket change. This is a Jarama, I’d say a comparable Jota will go for $20K. I believe that is collect-ability. I own a 72 750sf and 83 rgs ,both in perfect condition, the riding experience is fantastic, I would not trade them for any modern 200hp rockets, but of course it matters what ever you’re into! Love all bikes! !